Another in a series of posts about popular children's authors and their books. Cornelia Caroline Funke (pronounced: FOON-ka) was born in Dorsten, Germany, on 10th December 1958, she has a sister and two brothers. As a child Cornelia wanted to be an astronaut but instead she studied education theory at Hamburg University and then went on to study book illustration at design college. She began a career as a book illustrator but soon realized that she wanted to write and illustrate her own stories. During the 1980s and early 1990s, she became well-known as an author of children's books in her native Germany, with the Ghosthunters (Gespensterjäger) and Wild Chicks (Wild Hühner) series of books. But her international breakthrough came in 1997 when Dragonrider and later The Thief Lord (2000), both huge successes in Germany, were published in English and brought her writing to an international audience. Cornelia is best known for the Inkheart trilogy (Inkheart, Inkspell and Inkdeath) the first book of the series has been adapted into a movie. Cornelia has been writing for about 25 years and has written more than 40 books. Some 18 of her books have so far been translated into English, and this number is set to increase. Books by Cornelia Funke we have in our library: Princess Pigsty - a Picture Book; and copies of Igraine the Brave; When Santa Fell to Earth; Dragonrider; Saving Mississippi and the four books in the Ghosthunters series in the Fiction section. Also Inkheart and The Thief Lord in the Senior Fiction section. Upper Hutt Library currently holds copies of 14 children's books and 4 teen books by Cornelia Funke and one Teen DVD. The above information about Cornelia Funke was adapted from here, here, here and here. 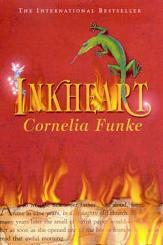 For more information about Cornelia Funke and her books you could visit the Cornelia Funke Fansite.